Players will be removed from the list as they sign. - Anyone making $375,000 + the minimum salary ($650,000 for 2017-18) will count in part against the cap upon a reduction to the minors. For example, a player making $1.2 million would count as $175,000 on the cap (1.2 M - [375k + 650k]). If you have any questions, either PM me or reply to this thread. (As this is a thread for everyone, if there's something you'd like covered, please let me know.) More information will be added throughout the season and as it becomes available. The thread will be cleaned out periodically to try to keep all relevant information within 1 page. Group 6 free agency is for players who are 25 or older, have played at least 3 pro seasons, aren't on their entry-level deal anymore, and have played less than 80 NHL games (28 GP) for goalies. Andre Benoit and Shawn Belle both qualified for this last season, Cedrick Desjardins (dealt by the Habs before the preseason) will as well. Finally, a real explaination on suspended players and the salary cap. I found this article but I really don't know where to post it. Kinda cool. All must see a ton of 2012 draft picks being signed lately. Why are they being signed now, when i assume most dont need to before June 1st, 2014. Are there advantages to say, signing Galchenyuk today, vs next March when finishing up junior year? 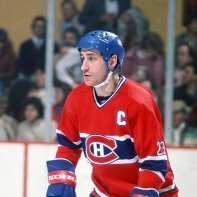 Habs normally wait to sign draft picks, is that a club policy or something? Generally speaking, this has become more commonplace in recent years. There's a cap advantage (albeit a minor one) to signing a prospect and then having them play in junior, referred to as a contract slide as I'm sure you've seen me mention before. Basically, the value of the signing bonus comes off the players' cap for each year they're signed, under 20, and not in the NHL. Case in point is Brendan Gallagher. He had a cap hit of $900,000 with a max signing bonus ($90,000). Although he signed during the year, it was before the March 1st cutoff (I think that's the date) so he qualified for a slide. As a result, his cap hit is now $870,000 (the difference being the $90,000 bonus divided by the 3 years on the contract); his 'salary' (including bonuses) is 900/900/810. Also, and this is speculation on my end, agents may be pushing the players to sign especially with talks of extended and only partially guaranteed ELC's (the 5 year proposal only has 2 guaranteed years plus 3 options). This is from Habsworld website. Basically that's the terminology I was given when I got the info. Modified is the popular term now which suggests that it changes throughout the deal whereas limited/partial implies that that it's a fixed restriction that isn't a full one (ie: 5 teams the player can block a move to for the duration of the contract). Brian I am confused. I thought ltir gave you the space to replace the guy you lost, so how is it adversely affecting our cap space? You are correct in that it opens up a spot for a replacement by allowing the team to exceed the cap by the amount of the injured player(s). However, while the team is in LTIR, the cap space that they have saved so far is reduced at the same time (straight-line amortization); the difference is what the LTIR credit is. Here's the 2011-12 capsheet where this happened, it may be easier looking at a visual example (look at the LTIR tab if it doesn't take you there). Any team that finishes the season while using LTIR has $0 in cap space; if you look at Capgeek, you'll note that any team currently in LTIR (all 10 of them) has a total of $0 in projected space. You cannot be under the cap and be in LTIR at the same time. The reason I say it's ideal to avoid LTIR for as long as possible is simply to preserve as much banked cap space as possible. The Habs will need a lot of it at the end of the year to cover the bonuses while it'd also be nice to have some for any trades/recalls/other pickups. Inevitably, it may happen if someone else goes down; if so, the goal then will be to get back out of it as soon as possible. I don't remember if you actually wrote one, but an article on the main Website about the Salary Cap / CBA would be GOLD ! Just one question about LTIR: if it turns out Briere is gone long term (let's say done until spring for whatever reason), would the Habs then put him on LTIR? I always thought that LTIR freed up the capspace of the injured player, but you said if you use it then you have $0 in capspace (but maybe that's just for the very end of the year). They could (it'd depend on who else is on at that time and how much they plan to go over the cap - if it's just to call up Dumont or something like that, they may not need to). In its most simplistic terms, LTIR does free up the cap space of the injured player. In reality, it only frees up the cap space of the injured player less any cap savings to that point (that's why the 'banked total' gets amortized). Worth noting is that the injured player - in this case, Briere - will still count in full against the cap, it's just that the Habs would be allowed to spend over the cap during his absence. A team that ends the year on LTIR will have $0 in cap space. A team that uses it but doesn't finish with it (the player comes back before the end of the year), cap space can start accruing again (since the team has to be under the cap before activating a player off LTIR). Here's a question Brian, Markov is 34 now but on dec 20 he will be 35, so if we sign him or extend him prior to Dec 20 how does the over 35 rule apply? It applies no matter what with Markov. The calculation is on June 30th of the season that the contract begins. In Markov's case, that will be June 30, 2014. - Waiver exempt players (Bournival and Gallagher) who have been on an NHL roster for 87 days or more prior to January 24th are entitled to an Olympic break if they are assigned any time after the 24th (5 PM EST) through to February 9th at 5 PM (one day after the Habs' final game). In other words, they are not eligible to play. However, they would collect their AHL pay instead of their NHL pay during this time. If they aren't assigned by the 9th at 5, they cannot be sent down for the duration of the break. - If a waiver exempt player (let's just use Bournival since this wouldn't happen with Gallagher) with 87 NHL days gets sent down prior to the 24th at 5 PM EST, he is eligible to play in Hamilton...unless (yay, exceptions to the rule...) Bournival is to play 16 of the Habs' final 20 games before the break. We're 8 games into that stretch, he has played 7 of those. - If Bournival gets sent down after 5 PM on the 24th and before the Habs' last game before the break , he is eligible to play for Hamilton in the time period between the date of demotion and the beginning of the break. - If anyone with less than 87 NHL days gets recalled before Jan. 24th (Beaulieu), they can be sent down and be eligible to play during the Games as long as they're demoted before February 9th at 5 PM EST. Bournival can be assigned to Hamilton during the Olympic break to save cap space up until February 9th at 5 PM EST. However, he will not be eligible to play for the Bulldogs during the Olympics unless sent before January 24th. The financial savings on the cap if they send him down for the break would be a bit over $57,000. Speaking of waivers, here is a chart for waiver eligibility. One small error is that the threshold for asterisked players is 10 games, not 11. Everything else looks good though. What happens after the deadline in terms of the call ups on the expanded roster? How much does the expanded roster effect the cap, or does it? As for the cap effects, the Habs have to stay under the cap at all times, that doesn't change from now. Post-deadline callups do count against the cap though (unless it's a postseason recall). "While that seems all well and good, it doesn't take into account potential performance bonuses." Bonuses are supposed to count against the cap in the year in which they are hit. However, teams can exceed the salary cap by using the bonus cushion. This in turn allows them to count current year bonuses on next season's cap, as Boston chose to do with Iginla by structuring his contract so that it was largely bonus-based. That's more of an exception rather than the norm. Are there bonuses (boni?) associated with winning the Vezina and the Hart? Yes, but they are league-wide bonuses, not contract-specific. As a result, they don't count against the cap like a typical performance bonus does. About pks hospital donation. Couldnt he have convinced Molson to make that donation in Subbans name and saved the team capspace? No. Anything like that would be construed as cap circumvention. Can someone explain that to an average person please? That is a good thing yes? Weber's contract was one of the heavily back diving ones that was outlawed in the last CBA. As part of the 2013 agreement, something called the cap recapture rule was instituted, to punish the teams for tacking on cheap years that no one expected them to actually play through. (Luongo's deal is another example.) Basically, at the end of a players' time with a team, the sum of their salary paid and cap hit are added up. The difference (salary paid - cap charge) becomes eligible for cap recapture if the player chooses to retire before the end of the contract. For Nashville, they saved over $24 million in cap compared to the salary they paid out in the time he played there under this deal. Because Weber's salary this year is $12 million (including an $8 million pay out due Friday), the Habs are on the hook for a bit of recapture over the first few years as $12 million is less than the ~$7.9 million cap charge they'll eat in 2016-17. After that it drops to $6 million/year for a while so after a few years, the sum of the cap charge they eat will exceed what they pay him, thereby taking Montreal out of any potential recapture charge. Hopefully that makes sense. 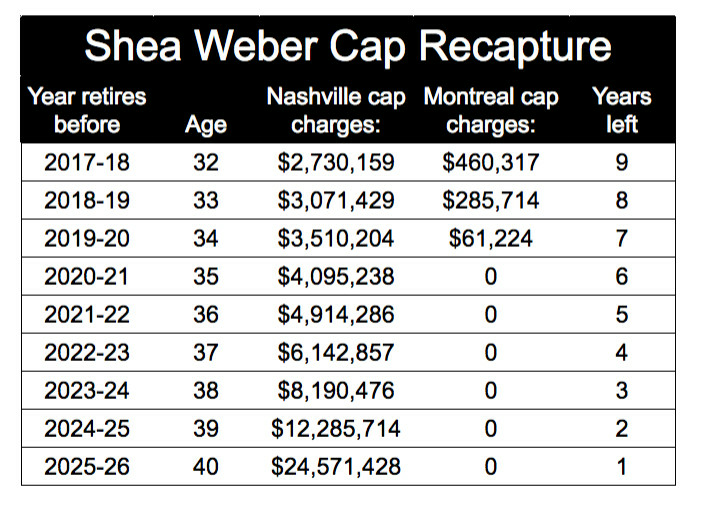 Basically, unless Weber decides to retire really early for some reason (like after the next year or two), the Habs won't be on the hook for any lingering cap charges through midway through the next decade. with Fanager down and nhlnumbers unavailable at my job, what other good website should I be looking to for nhl cap and salaries ? CapFriendly is the best resource out there currently. I'm not a big fan of NHLNumbers after I've seen them badly bungle the LTIR calculations/rules in the past. Spotrac is another option - their daily tracker isn't the best (it's not that descriptive) but the basic contract info is there. I've worked a bit with the person running Cap Friendly, he's quite thorough (and really did some good digging on an interpretation question we were debating a year ago) so that's the one I'm really going to recommend. - Any player on emergency recall can be assigned at any time during the freeze. While not specified by the team directly, Terry I believe is on an emergency recall. - Any player can be recalled during the freeze. I note this as it's possible that the three players in the first bullet point get sent down on the 23rd to save a bit of much-needed cap space and then brought back on the 27th once teams are allowed to practice again. When do teams have to be under the cap? They have to be in cap compliance by the season-opening roster deadline (so Tuesday afternoon). Last year the Penguins claimed Mike Condon on waivers from the Habs and then traded him to Ottawa when his services were no longer needed. I was under the impression that you couldn't trade a player acquired on waivers unless he were to successfully pass through waivers again. I don't remember the Penguins placing Condon on waivers prior to dealing him (I'm thinking if they would have, Ottawa would have just claimed him instead of giving up a pick). I only ask because the Habs are in a similar situation with Niemi. Could they deal Niemi if they wanted to (if someone would want him)? Condon didn't go through waivers a second time because no one else had claimed him when Montreal waived him (Pittsburgh was at the back of the waiver priority list) so he was free to be dealt. If anyone else claimed Niemi, the Habs would have to waive him and have him go unclaimed in order to deal him. If not, then they should be able to trade him. That said, does he really have much, if any, trade value? Question : If the Penguins trade Kessel does Toronto still retain salary? I was discussing this with a guy at work and we both wondered how this works. I thought that Toronto still had to pay part of his salary, but my co-worker was thinking that Pittsburgh would be on the hook for it because the deal was between the Pens and the Leafs and not another team. Thanks in advance. Yes. Toronto is on the hook for their retained salary if Kessel is dealt again. A contract can be retained on twice, actually - that happened with the Habs getting Devan Dubnyk a few years ago (Edmonton retained 50% to Nashville, Nashville then retained 50% of the remainder of the contract to the Habs). The first two posts of the thread have been updated to reflect next summer's free agent list as well as the 50-contract situation. I've also updated the waiver chart for this season and changed the formatting a bit to provide more long-term information. However, I've decided to not bother doing the Capsheet this season. For starters, the Habs are going to be way under the cap again so they're not going to be running into LTIR or a situation where there's going to be some number crunching required to see what type of room they have at the deadline. The other is that it wasn't used very often based on click stats so considering the time it takes to maintain it, I'm probably better off utilizing that time elsewhere. This can only be used twice during the season and for no more than 48 hours on each occasion. A random Sunday night note - Victor Mete reached $150,000 of his games played bonuses this season. Unless there's a GP bonus in Jesperi Kotkaniemi's deal that I don't know about (I don't have the details on all of his bonus structure but the Class B bonuses are usually for higher-end production), I don't think he hit any as he came up short on all of his Class A bonuses though he could still get $212,500 for a spot on the All-Rookie team. Some cool information I thought I could share. Players and their respective agent. Josh Brook 809 166 $ 2022 (RFA) ? Cale Fleury 771 666 $ 2021 (RFA) ? Cayden Primeau 880 833 $ 2022 (RFA) ? Daniel Audette 668 333 $ RFA ? Gustav Olofsson 725 000 $ RFA ?